Masuk’s Curtis Fedorko, left, and Newtown'’ Fritz Maurath wrestle in the 145-pound weight class finals during the SWC championships. NEW FAIRFIELD — After a long weekend, the South-West Conference wresting championships fell on the broad shoulders of Newtown’s 285-pounder Joey Zeller in the final match of the evening at New Fairfield High School. At the time, Newtown trailed upstart Barlow by four points. With just one more decision, Newtown would tie Barlow for the title. But a major victory would wrap the whole thing up for the Nighthawks, giving the squad their second league title in four years. With 14 seconds left, his teammates literally sat on the edge of their seats along the mat and Barlow anxiously looking on as well, Zeller took down Brookfield’s Rich Mitchell for the points that put Newtown over-the-top. Newtown won the SWC championship by a point over Barlow, 137-136. “Every single match counts,” said Newtown coach Ron Chivinski, whose team placed four wrestlers in the consolation round, winning two, and getting four finalists. “Every single kid who won a match here, determined us winning here. That’s it. This was a team effort. Indeed, Newtown’s performance throughout the weekend helped the Nighthawks build a 12-point lead over Barlow heading into the finals. Both teams placed four wrestlers in the finals, but none of them were matched against each other. But while Barlow claimed victories from Josh Brault at 106, Charlie Prather (by pin) at 113 and another huge pin by tournament MVP Carson Licastri in the 182-pound match, Newtown’s first three wrestlers lost. Bethel’s Eamon Tolland-Matos surrendered a point in the final seconds of regulation, but held off Newtown’s Nik Accousti in overtime with a 6-4 decision at 132. 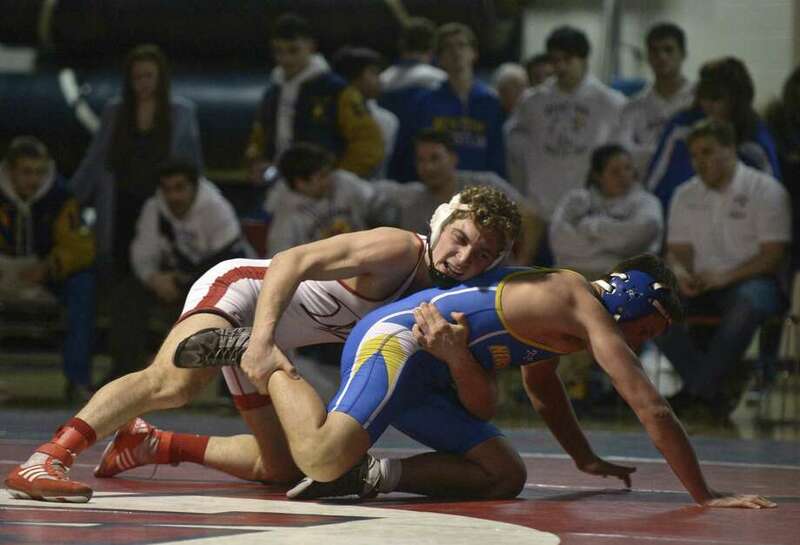 Masuk’s Curtis Fedorko — the winner of the SWC tournament’s career award — defeated Fritz Maurath at 145 and Masuk’s Jason Lobdell defeated Newtown’s Andrew Sayers at 152. Those results put Barlow ahead 132-130 and gave it a chance to clinch. But in the 220 match, Brookfield’s Adam Frame pinned Barlow’s Ben Bai in 1:50, setting up the thrilling finale. Zeller built a 7-1 lead over Mitchell in the third period. They were grappling and on their feet with 20 seconds left in the match. Mitchell tried to force the issue, but Zeller countered and dropped Mitchell for the takedown. “He was getting mad that he couldn’t move me,” Zeller said. “So I just smacked him down. He pretty much helped me. It was heartbreak for Barlow, in only its eighth season of competition, competing as a solo outfit for only the second year. The Falcons were runner-up to New Milford last season and were confident they could win the title. Barlow had a pair of consolation winners, which helped it edge closer to Newtown for the final round. New Fairfield finished third with 130 points, winning all three of its championship matches. Julian Soares posted a major decision over Pomperaug’s David Jutcawicz at 120; Hunter Chin held off New Milford’s Peter Coniglio, 4-3, at 126; Coleman Douchette pinned Notre Dame-Fairfield’s Mike Agate at 170. Defending champion New Milford, which had won three straight and 11 of the last 12 titles, finished fourth with 109.50 points. Rich Morrell’s 4-1 victory over Masuk’s Zach Minch was the Green Wave’s champion. Brookfield took fifth with two champions, Weston was sixth and Masuk, with two champions, finished sixth. Newtown’s Joey Zeller needed a major decision in the final match to edge Barlow for sole possession of the 2019 SWC wrestling championship. 285: Joe Zeller, Newtown maj. dec. Rich Mitchell, Brookfield, 9-1. Correction: A previous version of this story misidentified the Barlow head coach, it is Paul Chavez, who is in his first-year. Also corrected the story to note that Brookfield’s Adam Frame was also the 220 wrestler who pinned Barlow’s Bai to set up the final match.